In December 1963, a great white shark tore open Rodney Fox’s abdomen, broke half his ribs, punctured his diaphragm and lung, and exposed the main artery to his heart. He’s devoted his life to diving with sharks ever since. Fox returned to the water a year later, to film “Revenge of a Shark Victim” – where he shoots grey nurse sharks with an underwater rifle. The anger was short-lived as curiosity took over. After befriending two other attack survivors, Fox made the first shark cage and has spent the past four decades leading expeditions for filmmakers, scientists and thrill-seekers. I took a three-day trip led by his son Andrew, who’s been accompanying his dad for almost 30 years, to the Neptune Islands off South Australia, where seal colonies attract great whites. My preparation consisted of watching Steven Spielberg’s 1975 film “Jaws,” to get tips from Roy Scheider, Richard Dreyfuss and Robert Shaw on how to deal with the beasts. The part where Jaws destroys Dreyfuss’s shark-proof cage was not encouraging. That scene was filmed by Fox in the Neptunes, with real sharks and a dwarf in place of Dreyfuss to make the attacker seem bigger. I took the 45-minute flight from Adelaide to Port Lincoln with my friend, photographer Brett Costello. Drinking with divers and crew in the Marina Hotel’s bar the night before our expedition, we learned from the skipper of rival shark dive operator Calypso Cruises that the sharks had been active that day. Next morning, we boarded the 23-meter Princess II and greeted the 6 crew and 10 other tourists from California, Massachusetts, Florida, Canada, Switzerland, Israel, Italy and Australia. The biggest fear in the group wasn’t being eaten, but failing to see a great white. Not all expeditions are successful, and many in July and August hadn’t seen any. Those on sharkless trips are offered 50 percent off the A$2,495 ($1700) rate for a repeat trip. Another concern soon arose on the 70-kilometer (43.5-mile) trip through a heaving ocean: sea-sickness. By the end of the five-hour journey, I was throwing up over the side. My spirits rose and the fear of going sharkless disappeared as we arrived at the sheltered seas around the Neptunes and a 15- foot great white circled the boat before we’d dropped anchor. Andrew, skipper Mulga, and dive master Tim got to work, submerging the cage, attaching it to the back of the boat, dishing fish blood into the water, and cutting tuna chunks to use as lures. I put on my wet suit and entered the four-person cage. The water was cold and rough with visibility interrupted from time to time by swirling patches of fish guts. With my peripheral vision cut by the mask, I anxiously scanned the water for my first sighting, humming the “Jaws” theme tune into my air regulator: der-dum, der-dum. On cue, a great white appeared, black eye fixed on the cage of humans as it glided by. The shark seemed curious but not hungry; graceful rather than deadly. It circled a few times, then swam back to the blue depths — a sedate but wonderful first close look at the sea’s most-fearsome predator. Showered, warm and beer in hand, I watched my fellow travelers take turns in the cage. Viewing the creatures from the boat is lots of fun too and a convivial mood united those not in the water. We were spotters for dive master Tim, who worked the lure, jerking the tuna chunks away as sharks mount their attacks. As the sun set, we swapped stories in the ship’s saloon over a few drinks and a tasty lamb casserole. Andrew offered a range of movies: “Jaws anyone?” After watching it countless times on hundreds of expeditions, he was relieved when we declined. Andrew, 43, has been taking these trips since he was 14. His father Rodney led expeditions in smaller boats in the 1960s and 1970s for scientists and documentary makers. The first thrill seekers came in 1976, after Spielberg piqued the world’s interest in the sharks. Now Andrew heads the business while Rodney spends more time on education, conservation efforts and the Fox Shark Research Foundation. Competition has emerged. South Africa has Great White shark viewings, including one which does so without a cage, and there are dives in Guadalupe Island off Mexico. Andrew said Fox remains the only operator that lowers a cage to the ocean floor. I was in the cage early on day two. For 1 1/2 hours I scanned the depths with no success. Without the excitement of a shark to fire the adrenalin, you realize how cold 14-degree waters are. Shivering, I gave up and did some fishing instead. A fellow traveler snagged an 8 kilogram Kingfish, which skipper Mulga whisked away and transformed into sashimi for dinner. By lunchtime though, we still had no sharks, so Andrew and Mulga prepared the Zodiac for a shore visit to see the seals. 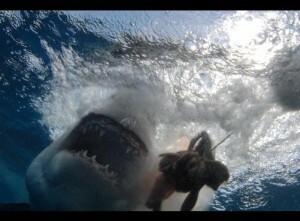 Then came the unmistakable splash of a great white; the island trip was off and I jumped back into the cage. They were everywhere. Chomp, one bit the Zodiac. Slam, another whacked into the cage. A dorsal fin sliced through the water as the 17-foot shark sped toward the dangling tuna; Tim whipped away the bait but the beast kept coming, smashing into the cage and munching the wooden trim at the back of the boat. Scheider’s famous line in Jaws — “You’re going to need a bigger boat” — sprang to mind. Thankfully, we had one. The ocean floor cage was lowered as two, three or four sharks appeared at a time. After an action-packed 90 minutes in the surface cage, I opened the top gate and stuck my head out of the water to ask if someone else wanted a go. “Behind you,” my friend Brett warned. I turned to see an approaching dorsal and ducked back into the cage as a set of razor-sharp teeth crunched at the bars inches from my face. Awesome.